Tables for hire ... Sydney, Melbourne, Brisbane, Perth, Adelaide, ... Australia wide! 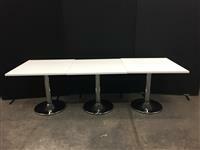 At Absolute Office Centre we enable you to rent tables for offices and functions. 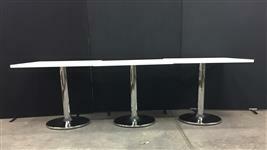 These tables have a cream coloured parchment top and come with a chrome weighted base. They are 720mm high. At the time of writing we have 10 of these tables available for hire. Perfect for your next event! We also have a range of Retractable Barriers or Tensabarriers which work perfectly with our Function Tables. Click here to find out more. To make an inquiry to rent tables, please feel free to contact us either by telephone (on 0418 574 767 or in Victoria on (03) 8420 7788), email or by using our Inquiry/Booking Form. As our available products change regularly, it is not possible for us to list every function table we have for rent or hire on this site. If you cannot find the function table you are looking to rent or hire here, please feel free to call us (on 0418 574 767 or in Victoria on (03) 8420 7788), email us or use our Inquiry/Booking Form to make an inquiry. We will endeavour to respond to your inquiry within 24 business hours.